ST. GEORGE — Founded in 1890, the National Society Daughters of the American Revolution is an all women’s service organization with a threefold dedication. The first is to preserve American history; the second is to promote patriotism; and the third is to secure the future of America through children’s education. Currently there are over 3,000 chapters of the DAR. There are chapters in all 50 states and some in foreign countries. In Utah there are nine chapters with two of them located in Southern Utah — the Color Country Chapter located in St. George and the Bald Eagle Chapter located in Cedar City. It’s an historic organization with over 180,00 members throughout the nation and parts of the world. But though the organization has a deep desire to preserve America’s history, they are also a vibrant group of women with an eye toward the future and a commitment to serving their communities. “This is not your grandmother’s DAR,” said Diane Tarbox, organizing regent for the DAR Color Country Chapter. The women of the DAR come from many different backgrounds and have unique interests but are bound by certain commonalities. Commonalities that include passion for patriotism and an affinity for family history. 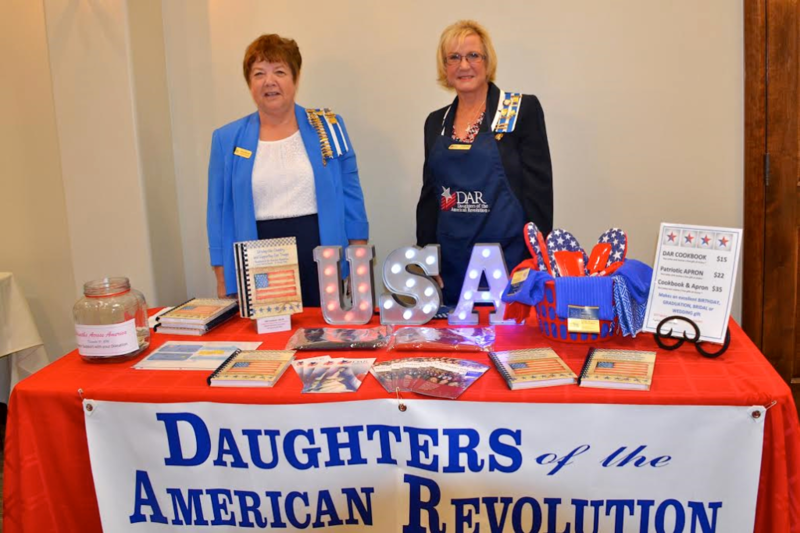 Any woman age 18 or older, regardless of race or religion, that can prove a direct lineal, bloodline descent from an ancestor who aided in achieving American independence is eligible for membership in the Daughters of the American Revolution, said Karen Shuman, regent for the DAR Color Country Chapter. The relationship to the ancestor must be proved through primary genealogical records. Though it might seem like an arduous task to meticulously scour family records looking for an ancestor who either fought in the Revolutionary War or who aided in the cause of the revolution in some way, many of the women in the Color Country Chapter said they didn’t set out to do that. “I was kind of an accidental genealogist,” said Judy Scott, a member of the DAR Color Country Chapter and committee head of flag and literacy. About six years ago, Scott and her husband were given a six month membership to the family search website ancestory.com, she said. Prior to her membership Scott knew as far back in her family line as her great-grandparents. As she got deeper into her family search, Scott found an ancestor from the 1700s who had been involved in the Revolutionary War. After moving to St. George about a year and half ago, Scott decided to see if she could become a member of the DAR. It is an organization, she said, that has helped her create new friendships as well as connected her to other family members. Valerie King, vice regent for the Color Country Chapter tells a similar story of how genealogical studies uncovered her patriot ancestors and how at her first DAR meeting she found a new cousin. As coincidence would have it, they were distant cousins, King said. Ten generations back, King’s patriot ancestor and her newfound relative’s patriot ancestor were brothers. Beyond the familial connections that are made through membership in the DAR, the organization is passionate about serving their communities as they promote their mission of preserving the past, promoting patriotism and educating the future. Spanning over 3,000 chapters, members of the DAR volunteer millions of hours of service to the communities they live in. They volunteer their time in schools to help children read or teach them about American independence and the Constitution. They provide scholarships and financial aid to students pursuing higher education. They help veterans groups and active duty military. In order to set the record and adhere to the strict standards set by Guinness World Records, each letter collected had to be handwritten, addressed to an active duty service member, placed inside a stamped, unsealed envelope and delivered in person to one of the designated stations set up at DAR headquarters, according to an article from the National Society Daughters of the American Revolution website. 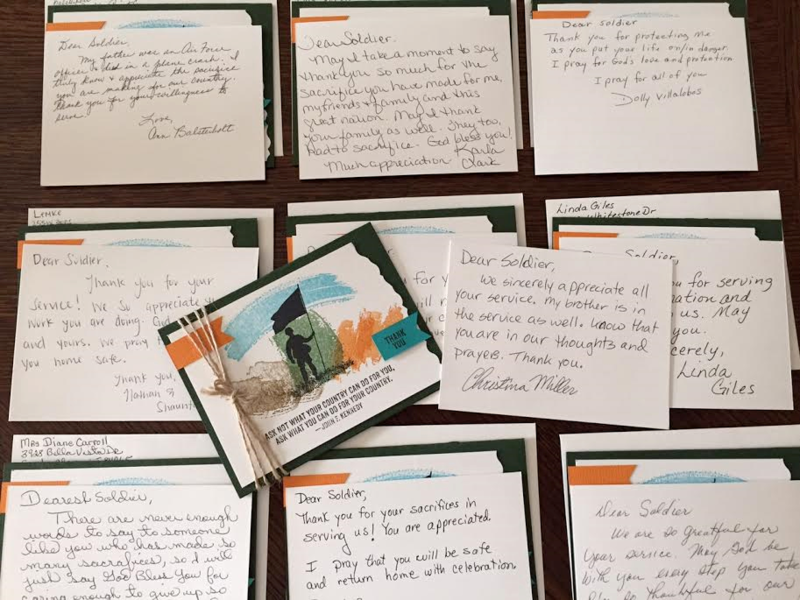 To reach their goal, the national organization had to collect and send at least 10,000 letters to active military personnel. In their own communities, the women of the DAR called on neighbors, church and civic organizations and friends and family to aid in their efforts. In the end the group collected a total of 100,904 letters shattering the 10,000 target. 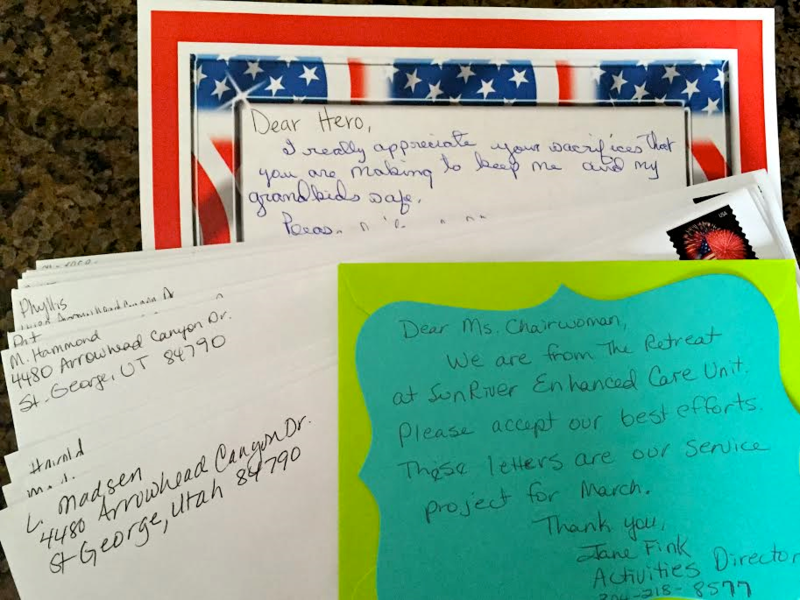 The DAR Color Country Chapter submitted 240 cards and letters written by residents from St. George, Toquervillve, Kanarraville and Cedar City, King said. 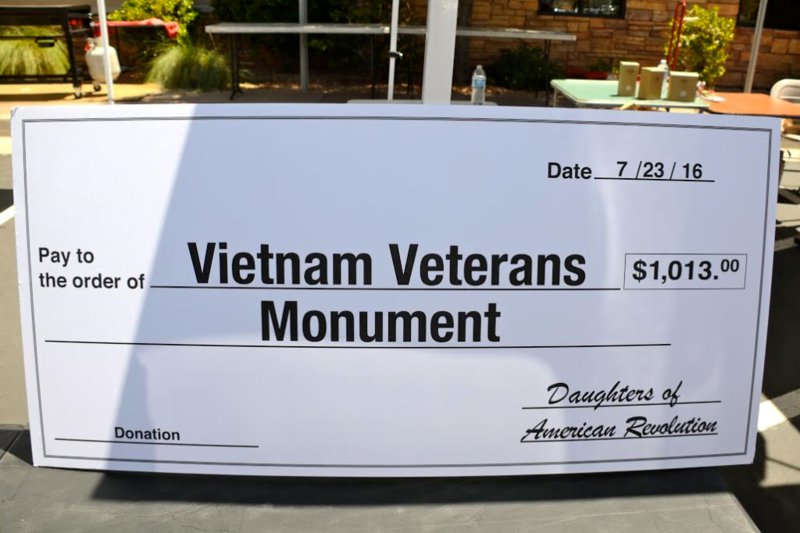 In July, members of the Color Country Chapter presented a check to the Vietnam Veterans Monument — a monument designed to honor veterans from the Vietnam War both deceased and living — slated to be dedicated Sept. 10. at Zion Harley Davidson. 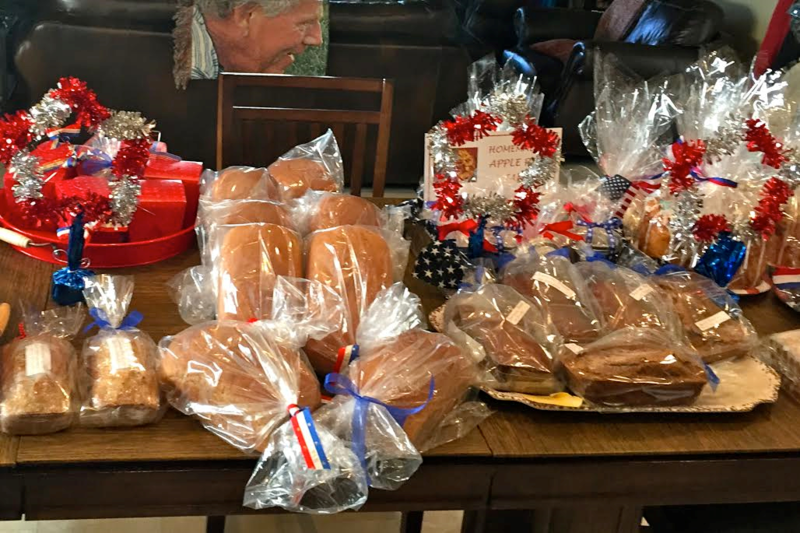 The women raised the money to support the monument and the Vietnam veterans living in Southern Utah through a baked goods sale held at a Memorial Day ceremony in SunRiver. DAR women are also involved in the Wreaths Across America program, which lays wreaths on veterans graves every December. The nationwide wreath-laying ceremonies take place at Arlington National Cemetery as well as thousands of cemeteries across the United States. In St. George wreaths are placed at Tonaquint Cemetery and the Shivwits Band of Paiutes Cemetery. 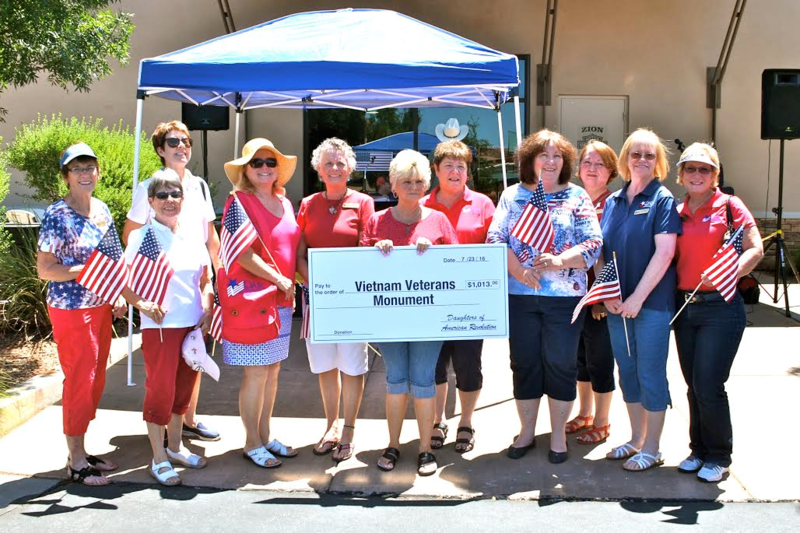 The DAR Color Country Chapter help facilitate the purchasing of the wreaths through fundraisers as well as participate in the ceremonies and wreath laying. It is the service they give that makes being part of the DAR so great the women said. “What gives me the warm fuzzies of the organization is how we give service to our veterans because they paid the price for our freedoms today,” King said. The DAR Color Country Chapter meets monthly on the second Tuesday (except June-Aug.) from 1-3 p.m. at the Family Search Center, 162 N. 400 East in St. George. Women interested in membership with the Daughters of the American Revolution are invited to attend a meeting. Members can assist prospective members in locating the proper genealogical records for submissions. For more information contact Karen Shuman, regent at 720-270-4387 or Valerie King, vice regent at 435-703-9560.